Views of Zion National Park from Angel's Landing. Laura Ferguson photos. 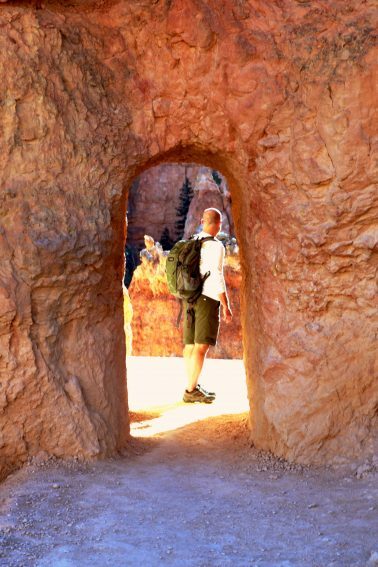 Everything You Need to Know to Hike Bryce Canyon: TIP! Rent the Gear for the Virgin River! I wasn’t sure what to expect on my first trip to Utah. Ranches, cowboys, Mormons? Southern Utah and Bryce Canyon are dramatic valleys, red sandstone rocks and landscapes Dr. Suess would find unique. Bryce Canyon is a wonderland in Utah. Laura Ferguson photos. Zion National Park offers a free shuttle, running about every fifteen minutes, which take visitors to all of the hiking stops along Zion Canyon Scenic Drive. Driving is discouraged as cars are only allowed with an additional permit. The shuttle does not run all year long, as we learned. Winter hours for the shuttle begin the Sunday after Thanksgiving and run through February. During warmer months, the shuttle operates through Springdale as well. The views from the shuttle bus along Zion-Mount Carmel Highway are pretty impressive. Bold and dramatic sweeping views of the canyon loom above and every stop is a memorable and acclaimed hike just waiting for you. Beautiful and striking vantage points for all levels; Court of the Patriarchs, The Grotto, Weeping Rock, and the Temple of the Sinawava. The striking Narrows, twenty feet wide in places. The canyon runs for fifteen miles and reaches an elevation close to 9,000 feet. The area covers 146,597 acres; that’s 229 square miles. We stayed at The Watchman Campground which is located right inside the gates of the south entrance to Zion National Park. The campgrounds fill up quickly in the warmer months and should be reserved months in advance. The Watchman is nestled right against a shopping center with coffee shop, grocery store, the Zion Outfitters store and the Visitors Center where you can catch the shuttle. It is adjacent to the town of Springdale which has plenty of shops and restaurants to explore while you're not adventuring. 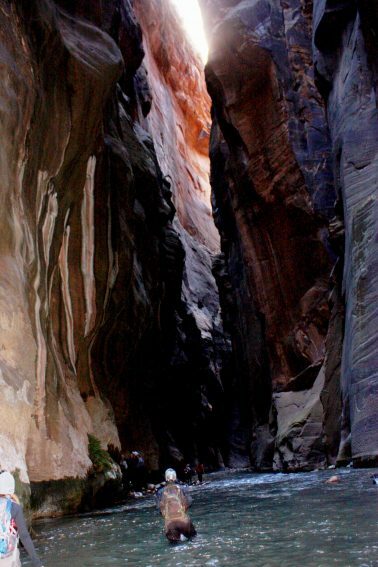 The Narrows, which was featured on National Geographic’s America’s Best 100 Adventure, is on the Virgin River. It's the narrowest canyon in Zion Canyon at only 20 feet wide and canyon walls over 1,000 ft high. It can be done as a day hike or overnight backpacking trek. For the camping option, the “top-down” route, you need need to obtain a permit months in advance. We pursued The Narrows as a day hike, we opted for the “bottom-up”’ route. You should be mindful of the time of year you attempt this hike. The Narrows is typically closed between Mid-March to Late-May from spring runoff. You should also definitely check the weather conditions prior to going. This is a serious flash flood zone, they can occur quickly and are very dangerous. The Narrows can be found at the final stop on the park shuttle, Temple of Sinawava, and at the end of the Riverside Walk paved path which ends at the banks of the Virgin River. This is one of the most popular hikes in Zion and one of the best slot canyon hikes in the world, you will hear the crowds as you approach. Another view of Zion National Park from Angel's Landing. Laura Ferguson photos. Do yourself a favor and rent the canyoneering shoes, neoprene socks, and wet pants. The gear kept us warm and dry and helped to make this adventure a lot of fun. The water of the Virgin River was chilly. Neoprene socks, shoe rental, and water pants are highly advised, we got ours at Zion Outfitters. We passed a handful of people who were ill-equipped wearing jeans and sneakers. There is no way you’re doing this hike, in November, without the proper gear. The water is cold and pretty deep in some places, the rocks are slippery. The canyons are really gorgeous, but you can’t walk and look up for too long. This hike requires your full attention to where you are walking. The river is crowded in the beginning, but the farther upstream you venture the fewer people there will be. With each bend in the river the narrower the canyon becomes and the faster the current. The water varies in places from ankle to waist deep. You will travel over rocks and small waterfalls. The sunlight illuminating the sides of the orange canyon walls, while in other places allowing only a sliver of light. While you are in the water a lot of the time, there are respites along the banks of the river allowing you to walk on solid ground. The hike was an out and back, so the distance you walk is up to you. We hiked three miles in, reaching Wall Street, sat atop rocks and ate lunch. Just beyond where we decided to call it quits the water was reaching people’s chest. Babbling creek on the trail to the Subway. On the trek back you are moving with the current of the river, which I actually found more difficult. 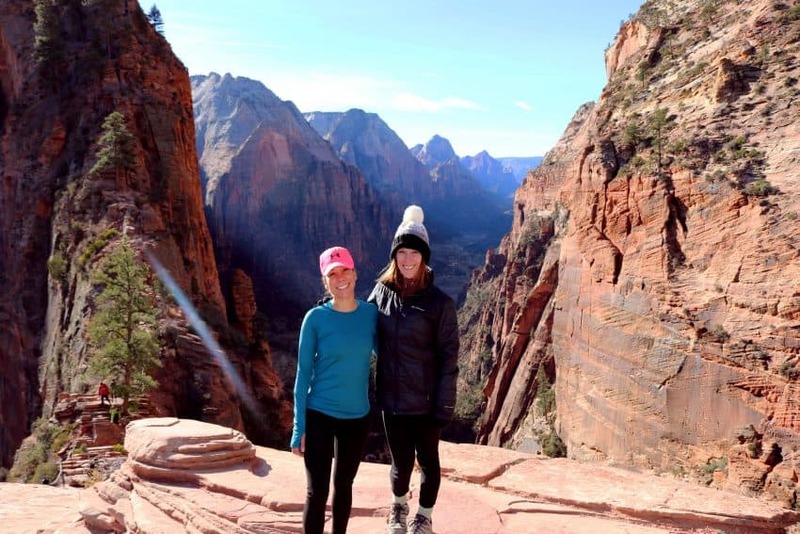 The Narrows is the quintessential Zion hike. It’s simply stunning and pretty amazing to be miles up a river between towering canyon walls walking along a flowing river, the canyon unveiling itself around each bend. A very cool experience. The trek was about 6 miles, but with the complexity of hiking in a river bed, we wrapped this hike at about 4 hours. The Subway is outside of Zion National Park on Kolob Terrace Road in the town of Virgin. You need to obtain a permit to hike The Subway. You can do so by going to Zion National Park's website and applying for one. In the busier months, the parks are busier and the permits are much more competitive, necessitating a lottery. During the winter months, it’s easier to obtain. Also note you'll need to pick up the permit in the park at the visitors center prior to the hike, so plan ahead. The Subway is similar to The Narrows in that you can hike it in two ways, you need to be prepared for flash floods and renting the water gear is advised. The Subway can be done from the top down or bottom up. The top-down route is a 10 mile, rappeling trek which can take an entire day or more depending on experience level. We experienced The Subway from the bottom up, which is a 6 ½ hour out and back hike. After a mild half-mile hike from the parking lot at the North Fork Trailhead, you’ll reach a steep descent into the canyon. After the canyon, around the 1 ½ mark there are dinosaur tracks cemented in gray mudstone. They’re not marked, and we didn’t happen upon them, but the internet tells me they exist. Do not be afraid to get wet. Early in the trail, you will find a distinguishable path carved out, but the further you go the more it just becomes following and walking in the river. You can zig zag along the banks, through the river, up over rocks, choosing your own path. The contrast of red rocks against a bright Utah sky and autumn colored leaves is lovely scenery as you hike on. About 2 miles in you will begin to see why this is such a notable hike. The river opens up to cascades, waterfalls, dramatic rock shelves. Many spots we passed looked ideal for swimming in the warmer months. As you approach The Subway the canyon will begin to take on a dramatic tubular shape. The cavernous entrance opens to the small pools of emerald swirling water, a magical little portion of the canyon. This is the turn around spot of the hike, but also where the top down canyoneers propel into. You will exit the same way you entered, that steep canyon. It is not well marked, so keep an eye out. It can easily be missed. 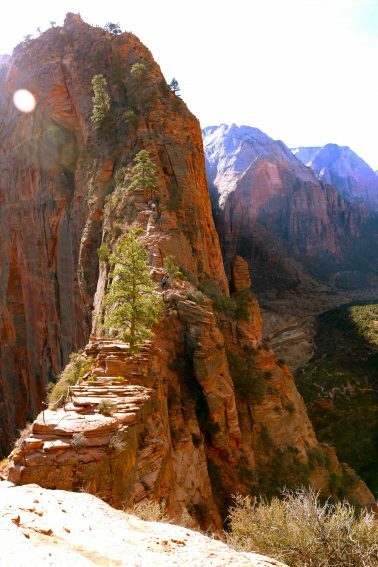 Called one of the most dangerous hikes in the United States by Men's Journal and Outside Magazine, Angels Landing is the most popular in Zion. People have died on this trail. That fact is mentioned frequently; over the PA system on the shuttle, on signs along the trail, in the recommended search offered up by Google. It is 5 ½ mile out and back, strenuous hike with an elevation gain of 1,500 feet. We got started early, getting in line to the shuttle at about 7:00 am. We were not the only visitors who had gotten the memo to hit it early. Many were in line when we arrived. The trail is notoriously narrow at the top, with many anxiety-inducing portions of one way only traffic and a chain to grasp for security. 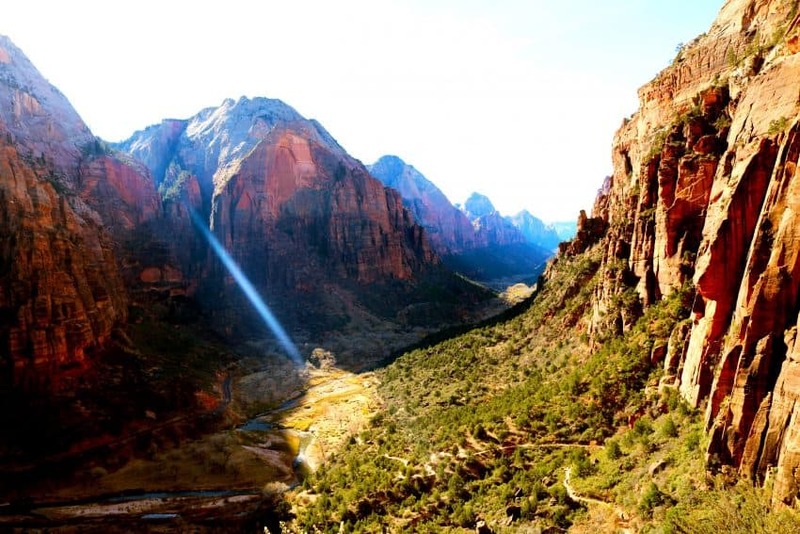 Angels Landing is at the 6th shuttle stop, The Grotto, and can be found across the street from the drop off point. The first two miles of the hike is on the West Rim Trail. It is a steady, uphill climb on a wide, paved trail. After a steady, uphill slog, the trail enters Refrigerator Canyon, where you will find a respite from the beating sun. When you hit Walter’s Wiggles you will know you’re getting closer. 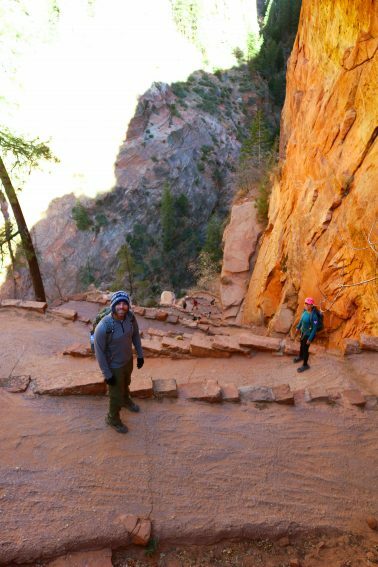 Named after Walter Ruesch, Zion National Park’s first superintendent who constructed it in 1926, the Wiggles are a 21 switchback climb to the final push of the trail. How they constructed this nearly 100 years ago, I have no idea. At the top of Walter’s Wiggles is Scouts Lookout. From here, we had our first view of the trail along the ridge. People stopped off here, contemplating the continued and precarious climb. Gazing through to Bryce Canyon. I am still surprised that they let regular people do this hike, it is intense. Heart thumping, knees wobbling, hands sweating, intense. I mean, you are up there, high, high up there. In many sections there are steep drops on either side, a narrow, rocky trail in front, and just a chain to cling to, protecting you from falling to your death. Zion’s website shows an older woman, a grandma, climbing to the top of the landing, grasping the chain bolted into the rock, mocking me from my internet browser. While preparing for our Zion trip I thought this will be easy peasy, Ethel over here is doing it in her velcro sneakers. But it was scary. The views are worth the effort and the repeated mental affirmations that I will be ok, I will survive this hike. On the way back down the trail got increasingly hotter from the rising sun and more crowded. People become less patient on precarious single entry paths, only to reinforce my initial thought to go early and get there before everyone else. It really makes for a more enjoyable hike, as the canyon wakes up and the views are all your own, no selfies to contend with. In total Angels Landing took us about 4 hours, from shuttle ride into shuttle ride out. Leaving us with our afternoon to take on Bryce Canyon! The hour and a half drive along Scenic Byway 12, which has been called the second most scenic drives in the country by Car and Driver Magazine, takes you from Zion National Park to Bryce Canyon. It’s a beautiful drive through open plains, canyons, small towns and if you’re lucky, mountain goats. 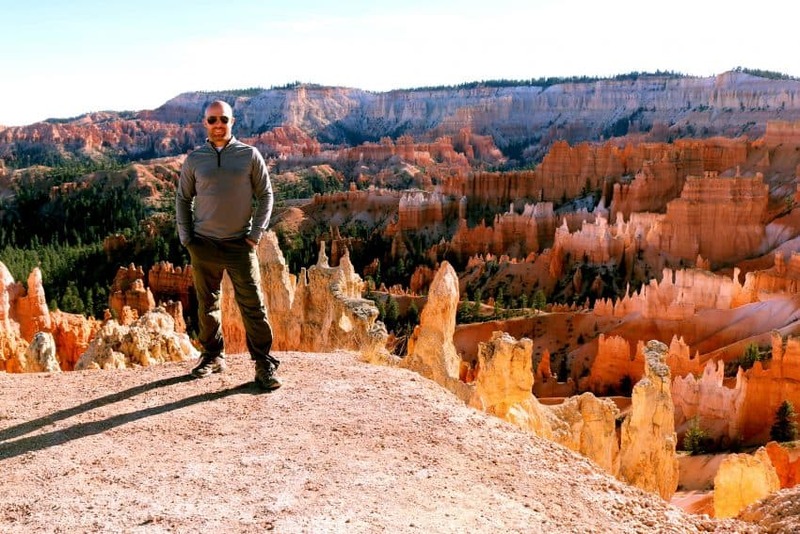 Once inside Bryce Canyon National Parks, the viewpoints are on the 18-mile road that sits along the rim of the canyon. There are a series of overlooks and trails along the top of the rim. Since we were visiting in the offseason the crowds were scarce, but I imagine in the summer months that this park could get very busy. It is a stark contrast in the landscape to the sheer cliffs of Zion. Jagged hoodoo rise from Bryce’s canyon floor. Carved by wind and water of millions of years, these hoodoos feel Dr. Suessian in their nature. Whimsical, like they belong in another world, a fairytale, and not here in Utah. I suppose this is the universal feeling as there is a trail named Fairyland Loop. From Sunrise Point we descended into the canyon to Queens Garden Loop and followed out the Navajo Trail through the winding amphitheater and ended at the famous Sunset Point just in time for sunset. As the sun set the shadows shifted and painted new colors combinations along the ridges of the hoodoos. Bryce far exceeded my expectations and I would love to come back someday to spend more time discovering this park. In total, we only spent about five hours here, making the drive back along the winding road to Zion in the dark. We left for home early the next morning, before the sun rose, in an attempt to beat the Las Vegas traffic. Utah, like Arizona and Nevada, hold so many hidden gems. So much exploring to dig into. I would recommend checking out Zion and Bryce in the winter months. We beat the crowds and were not subject to the oppressive heat of the summer season here. The temperatures were mild and enjoyable, and the trails were uncongested. We did prepare for cold temperatures at night but lucked out and experienced unseasonably moderate weather. Laura Ferguson is a camper, traveler, hiker, designer, photographer, writer, lover, learner, seeker living in San Diego, California. Visit her website.